The German ban on GM maize MON810: scientifically justified or unjustified? The ongoing controversies over genetically modified organisms (GMOs) in Europe remain intense. Assessing the risks associated with new technologies is crucial, and becomes particularly important for self-replicating GMOs used in open ecosystems. In general, scientific disagreement and debate is at the core of knowledge generation. However, in the GMO debate, it seems that pre-conceived conclusions can in some cases overshadow real data and factual results of investigations. In this article, we describe how the German ban on the cultivation of MON810 Bt-transgenic maize plant has been criticized for not having a sound scientific justification and provide arguments for why we disagree with this perspective. We do this by demonstrating in detail how arguments put forward by Agnes Ricroch and colleagues in an article from Transgenic Research are based on i) serious scientific flaws, such as omitting core results and misrepresenting others; ii) inconsistency in how laboratory studies that show negative effects of GM plant exposure should be followed up; and iii) a systematic selection of particular results and/or studies that match their own arguments. We conclude that Ricroch et al. misrepresent and selectively scrutinize certain data only. The effect of this double standard is that those only reading or referring to Ricroch et al. will be seriously misinformed about our study as well as in the discussion on the 2009 German ban of the MON810 GM maize. However, we do not claim that the ban was finally and irreversibly justified by the science referred to, including our own studies within the field. The German ban on MON810 was, and must be, a political decision, guided by valid scientific evidence. Genetically modified organisms (GMOs) have triggered controversies at a number of levels, from technical scientific details in risk assessment and regulation, to trade and other large-scale political decision-making processes. Clearly, these levels are interrelated. There is legitimate public concern over the safety of GMOs, related to putative human as well as ecosystem health. The concern must, however, be accompanied by scientific evidence. Furthermore, concepts such as ‘safety’, ‘risk’ or ‘scientific justification’ are not clear-cut and need definition and interpretation. This article discusses scientific results that have been used in political decision-making. It particularly highlights the ways in which the details of a scientific publication can be subject to both reasonable and unreasonable alternative interpretation, but also manipulation, when drawn into a political context. A good example of this, in our opinion, is presented in the article in Transgenic Research by Ricroch et al..
Ricroch et al. discuss the German ban on the genetically modified (GM) maize variety MON810, produced by Monsanto Company. The authors draw the conclusion that the ban was unjustified. They reach this conclusion by rejecting the scientific basis for the ban. A study by the authors of this commentary, published in 2008 , was part of that scientific basis. Here, we will analyze their critique and correct some misconceptions. The genome of the MON810 event is modified by the insertion of a bacterial gene called cry1ab. The protein product of this gene is a so-called Bt-toxin named Cry1Ab. This protein is toxic to some lepidopteran insect species (butterflies and moths), among which we also find the so-called “target pest species” for Bt-transgenic crop plants. These may reduce yields by feeding on maize plants. The European Commission approved MON810 in 1998, and permission for cultivation in Germany was given in 2005. The cultivation of MON810 has been controversial ever since. In April 2009, the Federal Office of Consumer Protection and Food Safety of the German government suspended the approval and banned cultivation of the MON810 maize. As justification of the ban, the German government argued that this maize represented a potential hazard to the environment, in particular to non-target arthropods, which constitute important parts of natural and agricultural biodiversity. Arthropod biodiversity is an internationally recognized protection goal, also because arthropods provide economically important ecosystem services such as pollination of fruits and vegetables. We emphasize that the 2009 suspension of the German MON810 approval had to be justified by scientific evidence, indicating or demonstrating hazards or potential hazards to the environment. The crucial question is whether the scientific evidence referred to by the German authorities satisfied these requirements. Dieseneuen und zusätzlichenInformationen, die Auswirkungen auf die Risikobewertunghabenbzw. dieseNeubewertung der vorliegendenInformationen auf GrundlageneueroderzusätzlicherwissenschaftlicherErkenntnisse, gebenberechtigtenGrundzu der Annahme, dass der Anbau von MON810 eineGefahrfür de Umweltdarstellt. DaherwirddurchdieseAnordnungauchnur der Teil der Inverkehrbringensgenehmigungvom 3.August 1998 ruhendgestellt, der den Anbaueinschließlich der Aussaat in die Umweltbetrifft. AngesichtsdieserSachlage muss auchnichtabgewartetwerden, bis die Risiken, die mitdemAnbau von gentechnischverändertemMais der Linie MON810 einhergehenkönnen, vollständiggeklärtsind. The essence of the text points to “new and additional information, [….] that provides justified reason to assume that the cultivation of MON810 constitutes a ‘hazard’ (‘Gefahr’) for the environment” (our translation). Further, it is stated that: “In the face of these facts, it is not necessary to wait until the hazards that can come along with the cultivation of GM maize of the line MON810, are completely clarified”. The German gene technology act requires risk assessments to enable safety-related decision-making. But it also requires that the government prevents hazards (‘Gefahrenabwehr’). ‘Gefahrenabwehr’ is a legal concept related to precautionary action. The government, in its duty to prevent hazards, may invoke the precautionary principle if scientific uncertainty excludes a clear evidence-based decision, or if available data are inconclusive or contradictory. It is noteworthy that the identification of a ‘hazard’ – the first step in an environmental risk assessment – is the basis for the German ban. This makes sense according to a precautionary approach to regulation, meaning that a ban must not wait until the ‘hazard’ is a confirmed (and thus real) ‘harm’ to the environment. Monsanto, wanting to lift the ban, filed a legal court case just after the decision to ban MON810 was taken. The court in Braunschweig rejected the recourse from Monsanto (Beschluss Az. : 2B 111/09, May 2). The court stated in its decision that the science behind the ban constituted sufficient evidence for a legal action. The Bøhn et al. study was specifically mentioned in the court decision. As we will detail below, the core of the ongoing controversy boils down to a discussion of i) scientific quality (methods, controls, statistical power, significance, interpretation) of a few selected recent studies, and ii) the relevance of these studies. According to the German suspension order (GSO), the government could only justify a ban if there were new and additional scientific information available. Ricroch et al. argue that the re-authorization given by German authorities in 2007 implies that new evidence (for the later ban) must be judged from studies after this point in time, i.e. after 2007. The logic seems to be that scientific evidence keeps its initial interpretation once and for all, not being open to reconsideration, reconditioning and improved comprehension. We argue that scientific observations and evidence clearly may (indeed, for the sake of scientific integrity must) be subject to new interpretations, ramifications and alternative hypotheses and meanings, particularly when new data on related issues are published. This is at the core of all scientific development and evolution of knowledge. The GSO does in fact cover this. In Art. 20.2 it is referred to "a new judgment of information on the basis of new or additional information". Ricroch et al. thus fail to fully inform the reader about the content of the law, and also fail to recognize that scientific knowledge must be open to new interpretation. Ricroch et al. emphasize their critical assessment of two key publications, namely a study on water fleas (Daphnia magna) by Bøhn et al. from 2008 , i.e. our study, and a study on ladybirds by Schmidt et al. from 2009 . These studies provided new evidence of harm to non-target organisms, appearing after the 2007 German re-authorization of MON810, falling within the GSO category “new or additional information”, which the 2009 ban was justified by. The scientific quality of these publications was, thus, identified to be of crucial importance, which triggered the response of Ricroch et al. specifically to our work but, together with two further critical publications, also to the other ‘new’ study by Schmidt et al., see [5, 6]. In their overall evaluation, Ricroch et al. conclude that they cannot find any justification for the German ban of MON810 maize because of i) the weaknesses of the two above-mentioned studies, and ii) a general lack of possible effects under natural field conditions, as judged from the existing scientific literature. We find our own study badly presented by Ricroch et al.. Most seriously, the key results are overlooked. A number of strong criticisms are in reality unsubstantiated, and our results are inaccurately cited and interpreted. A key issue is what is deemed relevant and appropriate and what is dismissed as irrelevant or ‘not significant’ for risk assessment. It is in the details you find, not only the devil, but also the center spot of knowledge, from which (sometimes) political decision making revolves. Let us therefore have a look at the scientific arguments, and let us respect the details properly. Bøhn et al. claimed to have demonstrated significant and negative long-term effects on a well-established aquatic arthropod model organism, Daphnia magna. When compared to its unmodified maize counterpart, it was concluded that the tested Bt-transgenic maize had a lower quality as a feed source. The authors called for greater attention, not only to the runoff material from transgenic agricultural fields but also for the sensitivity of aquatic non-target organisms to transgenic plant products and Bt-transgenic crops. The following alleged weaknesses in the study by Bøhn et al., were laid out and numbered by Ricroch et al.. Lack of information as to whether the maize lines tested were near isogenic or not. We obtained maize seeds from the Philippines that carried the MON810 cry1Ab transgene crossed into a local commercial variety, called Dekalb 818YG (Yield Guard) and the unmodified (UM) recipient local variety of maize (Dekalb818). We were not able to find information about the exact number of backcrosses made to obtain the transgenic Dekalb 818YG. The two lines were simply the commercially available pair of MON810 and its local “counterpart comparator”, the lines that would be planted in the field. It is meanwhile widely known that corporations developing GM seeds do not share their information with independent researchers . By not providing proper material, including its description, unless a secrecy agreement is signed and based on a shared view of content and methods of research, biotechnology companies can effectively block independent research on the quality and safety of their products. This is directly relevant to the case and indeed a serious and unacceptable situation. However, Ricroch et al. seem to accept this hurdle (since they do not mention it), created by the producers, and instead they attack researchers that use the best available material. Related to our study, it was important to use transgenic Dekalb 818YG and its comparator that had grown under very similar environmental conditions. Our test lines were sown and harvested at the same times, grown ‘side-by-side’ on two fields of similar sizes, separated by a small river. We tested each variety with PCR, and found no transgene cross-contamination between the fields. None of the fields were sprayed with any pesticides. Lack of information about the nutritional content of the two test lines. This critique is valid and such information would indeed be valuable, in particular since there were significant fitness-differences between D. magna fed GM versus UM maize feed. When we observed fitness differences in our test organisms, we presented several possible explanations for their appearance, including whether they were caused by potential nutritional differences. Our data, however, supported the hypothesis that a weak toxic effect was the underlying mechanism since earlier reproduction of animals fed Bt-maize came at the cost of later fecundity and survival/longevity. This trade-off and its indication of a toxic effect rather than a nutritional effect were not mentioned by Ricroch et al. . Lack of at least two external control lines for comparison in order to have a wider comparative reference material. More and wider controls in an experiment may improve the understanding and interpretation of the results, although not necessarily and not always. But they always come with two important costs: i) less clear hypotheses and ii) less clear interpretation of results. Using external control lines means to compare plants with an unknown number of different genes/traits, adding new and unidentified sources of variation. We simply tested whether Dekalb 818 and Dekalb 818YG (with the MON810 trait), grown side-by-side in the same environment, represented food sources of the same quality for our model organism. This rather straightforward and realistic study-design mimics how non-target organisms would meet these plant materials in the field. In addition, there is a trade-off cost of statistical power by (i) including more experimental groups, or (ii) using disproportionally many experimental animals as controls. This will increase the risk of statistical type II errors, i.e. masking potentially harmful effects. Doing so has been widely recognized as a non-precautionary design [8, 9]. No data were provided on the dose of toxins the daphnia were exposed to (and how much they ingested). This is simply incorrect. We measured the level of Cry1Ab toxin in the maize kernels, resulting in an average of 67 (+/− 27) ng toxin per gram of dried tissue. We then fed each animal 0.4 mg dry weight of maize per day. The exposure is then simply given by multiplying the dose of the feed with the toxin concentration in the feed. All of this is described in the Bøhn et al. article, see p. 586. We did not measure the specific ingestion or uptake of Cry1Ab toxin in individual test organisms and would welcome suggestions for a good protocol on this in Daphnia spp. We also note that the critique of not having measured the ingested part of a toxin would apply to the majority (if not all) of ecotoxicology studies ever performed, including those submitted for regulatory approval by the applicants, i.e. the core data basis for safety assessment and approval by regulatory authorities. We are not aware of any similar critique of studies that showed ‘no effect’. This constitutes a double standard from Ricroch et al. The survival in the control groups was (exactly) at the recommended 80% at day 21 (OECD reproduction test guideline 211, adopted 2008). There was already a marked difference in survival at day 21 (95% confidence intervals do not overlap the mean of the comparator). The differences in survival increased further after day 21. After 42 days an overall significant difference in survival (p = 0.029, coxph test) between GM and UM fed animals was demonstrated. GM-fed Daphnia were expected to live 28.2 days and the UM-fed Daphnia were expected to live considerably longer, 45 days. Ricroch et al. thus misrepresent and selectively scrutinize certain data only.
" “Another parameter considered by the authors (proportion of females reaching maturity) is dependent on survival whereas fecundity parameters provided inconsistent results (some improved with the GM feed)” (p. 3). " We did not only ‘consider’ female survival to maturity, we measured it. We also gave the readers the full data-set in the figures, including between-experiment variability. What was inconsistent in our data-set (also fully revealed in the article) is the individual fecundity (mean number of eggs per female) where some values improved with the GM feed, and in one experiment significantly so (p = 0.043, t-test). However, there was no significant overall difference in fecundity between GM and UM fed animals. And for the total number of eggs produced in the two treatments, there was a 20% higher production of eggs in the UM-fed group; again, this was not mentioned by Ricroch et al..
For both survival and fecundity, Ricroch et al. seem to pick and choose information that supports their pre-conceived conclusion: that there was no scientific justification of the German ban on MON810 maize. This means that those only reading or referring to Ricroch et al. (such as Stephenson ) will be seriously misinformed about our study. This is particularly pertinent since Ricroch et al. state, with reference to their own finding from an “unbiased stakeholder consultation” : “for all stakeholders, raising the objectivity of the debate on GMOs is the most important request” (p. 10). We unreservedly agree with this stakeholder view. However, it is not a standard that Ricroch et al. actually live up to! In line with their apparent selective strategy, Ricroch et al. point to the importance of a case-specific evaluation for risk assessment (with which we agree). They detail their view by referring to the monarch butterfly case. For the monarch butterfly, the first laboratory tests showed increased mortality after exposure to Bt-pollen , notably from the then cultivated event Bt 176 that expressed high levels of Bt-toxin in its pollen. However, follow-up studies indicated that exposure rates in the field likely would be lower than those necessary to cause mortality when feeding on the then dominating cultivated Bt-maize event MON810, as judged from the first laboratory tests using event Bt 176. Thus, concern for the monarch butterfly was relaxed . We agree to the idea of follow-up studies with increased realism. But how can Ricroch et al. make such a statement, and then, in the very same article, forget to recommend a similar follow-up for D. magna, after negative fitness consequences were shown in the laboratory at high exposure? In the case of D. magna they seem to have lost all curiosity, and have no further questions related to the documented quality-differences between Bt-maize and non-Bt-maize in our feeding study. Compared to their expressed follow-up “needs” in the monarch butterfly case, this is highly inconsistent. We would argue that even for the monarch butterfly, Cry1Ab-toxin is still toxic and thus a negative factor. From the literature we have only limited information on the variability in Bt-expression according to seasonal, climatic and stress-induced changes , and even less for the upcoming multistack plants expressing multiple Bt-toxins at higher concentrations than in the now out-phased MON810 single gene event. The potential cumulative or combinatorial effects of various Bt-toxins expressed in different Bt-plant species, as well as for multiple Bt-toxins (as of today, up to six in ‘Smartstax’) expressed in a single plant, clearly calls for revisions of obsolete risk assessments based on single cry gene events. There is a tendency to overlook that laboratory tests do not represent worst-case scenarios . It is more precise to say that laboratory studies test single factor, short-duration, often in high dose experiments under stable conditions without concomitant stress from biotic (competitors, predators, parasites, etc.) and abiotic factors (climate, pollutants, etc.). Such environmental factors are likely to stress organisms in addition to what they feed on and what they are exposed to. A more recent study by Bøhn et al. tested the impact of predator smell in addition to feeding Bt-maize (the same MON810-based feed as discussed above) in D. magna. It was shown that fitness differences increased between animals of D. magna fed Bt- versus non-Bt maize when test animals were exposed to a fish predator as an additional stress-factor. In line with this, Sih et al. showed that a pesticide (carbaryl) was 46 times more toxic when a tested tadpole species was under threat of a predator in addition to being exposed to the chemical. Such results provide insights beyond additive standard tests and may illustrate limitations in existing risk assessment methods and protocols. Field studies, on the other hand, do not solve all our problems since complexity, multi-factorial causation and large intrinsic variability can both mask real effects and blur interpretation of observed effects. Ecotoxicology is challenging: we need to extrapolate from screening studies in the laboratory, to real-world, realistic exposure scenarios in the field. At the same time, we need to critically discuss the uncertainties and limitations of field studies. Again, Ricroch et al. cherry-pick what suits their argument rather than bringing in the complexity of the issue. Ricroch et al. note that feeding a 100% maize diet is unrealistic for an environmental evaluation of the impact that Bt-transgenic maize may have. Ricroch et al. selectively quote the Bøhn et al. article that such a laboratory study represents an “artificial situation”. However, what they fail to report is, as we explain in the article, our intention “to perform an initial screening of potential Bt-maize effects on a non-target organism” and our conclusion that “The results indicate that D. magna, and potentially also other related aquatic zooplankton species, might be vulnerable to transgenic Cry1Ab-maize. Although the causality of the observed effects still remains open, our results go along with others[15, 18, 19]and call for further testing on non-target arthropods under varying conditions” (p. 591). The mode-of-action of Cry-toxins is still unclear and may be more complex than realized so far [18, 20, 21]. Further studies are needed. 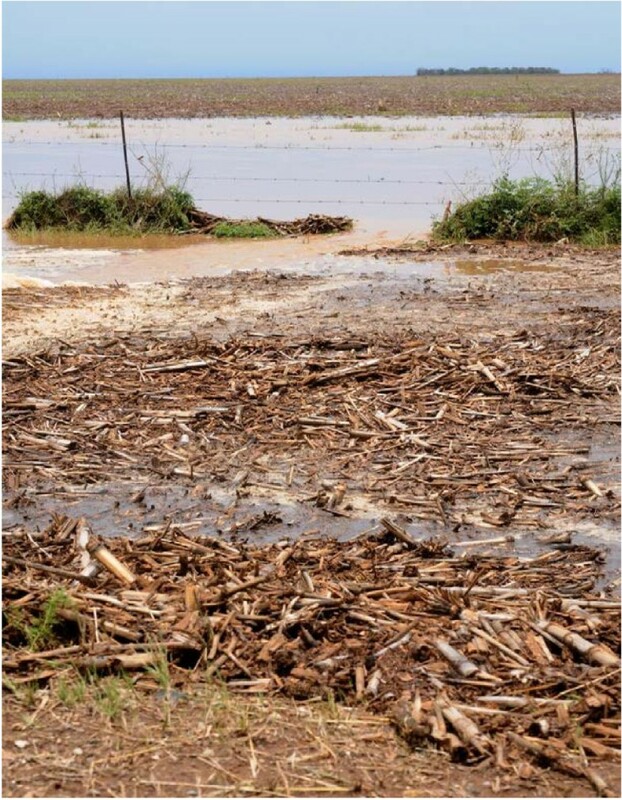 After observing several run-off aquatic systems near Bt-transgenic maize fields (non-transgenic would look the same, of course) in South Africa (Figure 1), we actually notice situations where run-off streams near monoculture fields will be packed with maize plant debris. This run-off material will be mainly leaves and stems, which for a start contain about 5–20 times more Bt-toxin than kernels (which we tested on D. magna) . Based on the observed negative effects on fitness in the Bøhn et al. study, where animals were fed kernels, effects in ponds and other run-off systems near to Bt-maize fields may even be underestimated, due to a much higher toxin concentration in plant parts. However, the break-down rates of both the Cry1Ab toxin and the Bt-transgenic material itself would also be relevant (see e.g. ). If the Bt-toxin was not the cause of the effects, there are good reasons to study other unintended effects like up- and down-regulation of endogenous maize genes, etc. in more detail. Maize run-off material near a Bt-transgenic maize field. The run-off consisted of maize stems, leaves and other plant parts. The maize contribution to the overall biomass was close to 100%. The relevance of run-off material from Bt-transgenic plants has already been demonstrated and discussed following an article by Rosi-Marshall et al.. That study emphasized a seemingly overlooked route of exposure to Bt-toxin produced by genetically modified plants: into aquatic ecosystems from agricultural fields. The authors demonstrated that Bt-transgenic pollen, leaves and other crop byproducts contribute significantly as an energy source for the aquatic fauna in local streams, and that two non-target Trichoptera species (caddisflies) were negatively affected when fed high doses in the laboratory. A couple of studies testing invertebrate communities in Bt- versus non-Bt-exposed streams did not detect negative effects ascribed to the presence of Cry1Ab toxins [23, 24]. Management of agricultural streams will need to consider multiple sources of stress at larger scales . The bias in Ricroch et al. Ricroch et al. present a qualitative methodological critique of our study demonstrating harm from MON810 on D. magna. Interestingly, they do not make any attempt to investigate whether laboratory studies reporting no observed effects of GM materials are methodologically flawed or suffer from unrealistic assumptions. Ricroch et al. conclude their article by claiming that the study by Bøhn et al. is “inconclusive”. This is incorrect. Our results clearly demonstrate negative fitness effects on D. magna fed GM maize MON810 in controlled, fully randomized and repeated experiments in the laboratory. We argue that the Bøhn et al. study was conclusive and yielded evidence that Bt-transgenic maize may harm the non-target aquatic arthropod D. magna. The logical follow-up would include extended studies aimed at identifying the mode(s) of action and potential consequences in the field. The critique by Ricroch et al. contains bias and serious flaws in its science, e.g. by misrepresenting and omitting important results. Ricroch et al. also forget to follow their own recommendation: relevant risk assessment studies showing negative impacts in the laboratory should be followed up in the field. We therefore reject the conclusion by Ricroch et al. that the German 2009 ban of MON810 was based on flawed science. On the other hand, we are not claiming that the ban was finally and irreversibly justified by the science referred to, including the Bøhn et al. article. We simply argue that our study on D. magna does present valid scientific evidence that can legitimately be used to inform policy. The German decision to ban the MON810 maize was, and must be, a political process that is simply informed by scientific evidence. That’s how democracies work! TB, RP and TT drafted the manuscript. The authors declare that they have no competing interests. All authors read and approved the final manuscript.